Respiratory Compression Belt user list grows as more and more states are added, Aktina continues to lead the way. Aktina partners with C-RAD for US distribution of Sentinel. Aktina releases 2nd generation PinPoint. Wykoff Hospital implements Aktina SRS-turnkey solution. Aktina collaborates with Memorial Sloan Kettering. In recent years, radiotherapy treatments have become more targeted and precise when the disease presentation allows it. Early detection has been proven to lead to better outcomes, but affected areas in early stages of a cancer’s development are typically smaller in size, which presents a new set of treatment challenges, and creates a need for high imaging, positioning, and treatment equipment accuracy. What is the best way to ensure the necessary accuracy? The answer is straightforward and clear: The best way to ensure equipment accuracy is to employ a consistent calibration regimen. Note that for any particular measurement, there are often multiple calibration schemes available, with these schemes differing in approach, accuracy, cost, and relevance. For all calibration approaches, it is important that when any choice of method is made, the user needs to know all the factors that affect the calibration process to a significant extent and make sure they are taken into account. Let’s consider how these ideas apply to a radiotherapy-specific example; the calibration of an Active Breathing Coordinator system. The Active Breathing Coordinator system (or, ABC) is designed to help patients hold their breath in a predictable way. This is particularly valuable for treatment of tumors in the abdomen that can move during breathing. One key to successful use of this system is for the patient to inhale the same measured volume of air before each breath hold. The ABC is designed to measure the volume of incoming air using a small, lightweight sensor that minimizes the disruption of normal patient breathing, and for the system to work, this sensor must measure accurately and consistently during successive treatments. Thus, the system is designed to be calibrated, with adjustments to ensure that the measured volume of air is consistent from day to day, week to week, and even when the sensor might be replaced between treatment sessions. The previous standard method for calibrating the system was to use a physical plunger of known capacity to simulate patient breathing. With this method, the volume of the plunger can be accurately known, but other factors that are important to calibration accuracy are difficult for technicians to control. In particular, the rate of the breathing simulation flow should ideally match a typical patient to check that the spirometry will be accurate. If the rate of the airflow cannot be controlled accurately and consistently by different technicians, or by the same technician over days and weeks, then the accuracy of the ABC calibration will suffer. Automating the calibration process, if possible, is one way to reduce the amount of human-induced variation. 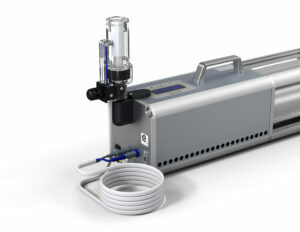 Today, there is an automated option for calibrating ABC systems – called the Spirocheck Duo calibration system from Aktina. Like the traditional calibration approach, it uses a plunger to deliver a known volume of air to the ABC, but instead of being manually operated, it is powered so that the rate of the air delivery can also be controlled in a repeatable, accurate manner. In this way, the Spirocheck Duo controls both of the important calibration factors rather than just one of them. As an additional benefit of the automated system, it is designed to automatically check both the spirometry of the ABC system and the operation of balloon valve that is used for stopping the volume flow at the start of a breath-hold. This is a great example of the benefits of a well-designed automated system – a combination of high accuracy, low cost for each test, and a short time required to execute the procedure. The entire calibration and operational check takes less than 5 minutes, and the system captures the results for auditing purposes. Because the automated process is so quick and easy, the calibration can be performed daily at a minimum, and if desired, as often as before each patient. To learn more about how employing an automated calibration system will improve the accuracy of your ABC system and can lead to better outcomes, please contact us today!